Forums > General Discussion > HAPPY BIRTHDAY PAISLEY 16! 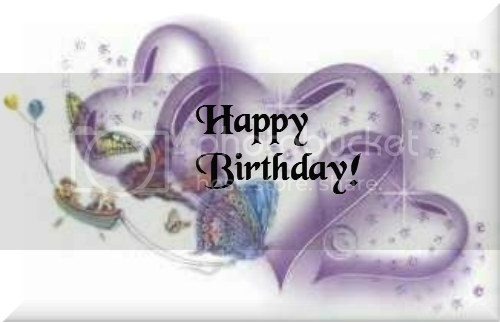 Have a Great Day, Gail!!! I'm not sure who Paisley16 is but Hey! She's not on as much anymore... but it's still her birthday! I never saw a Paisley16, but hey..a Paisley is a Paisley! Happy Birthday! been having a hard time facing this birthday- need all the cheer I can get!! what's wrong? are you turning 87? I turned 40 last summer. I've become "new & improved"
Embrace this year... Next June, U'll join us in the "40 & FABULOUS" Club! and thanks for starting this post my friend. It def. cheered me up! you r so sweet!! I thought U were 39 this year. U're already 40 & Fabulous! my dad is about to turn 56 and between wine festivals, trips to the beach, concerts in the park with his girlfriend and hanging out at expensive restaurants I can't afford...his life is 100 times more exciting than mine! I know it sounds cliche, but I feel great, look a LOT better than some of the people my age, and I have the money to do the things I wanted to do when I was a lot younger- and am still in shape to do them!